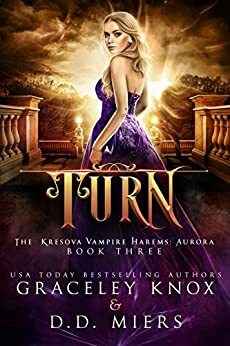 Book three in the Kresova Vampire Harems: Aurora, Turn by Graceley Knox and D.D. Miers. Carver has been taken and Aura is determined to find him. But at the same time Abe is calling her. So with Carver gone, Lucian and Aura set out to rescue Abe hoping he will be able to allow them to save Carver. Lucian and Aura come up with a plan bringing Row and Reina along to Romania again to find Abe. After finding Abe and waking him, Aura is brought face to face with Marius, the man that bombed Morana’s partying stealing Carver away. She is unhappy about having him along especially with the feelings that she begins to feel for him. She had thought that when she saw him in the hall that it was nothing, but she starts to realize that their might be more to Marius than she thought. Can she, along with Lucian and now Marius save Carver from Morana? Or is it too late for him? While this wasn’t my favorite in the series, book 2 was my ultimate favorite. I love the combination of Graceley and D.D. They are a great writing duo that has added to Aura’s story really well. I like how Aura has grown in the stories and isn’t willing to do anything for the men that she loved. I am not really fond of her newest addition. I am trying to see what merit he adds, but I feel with the later books in this series it might come to fruition. Carver and Lucian are great for Aura and with the events of the book I liked them a lot more. They are two strong characters that I look forward to reading more about. Check out book three, Turn here.